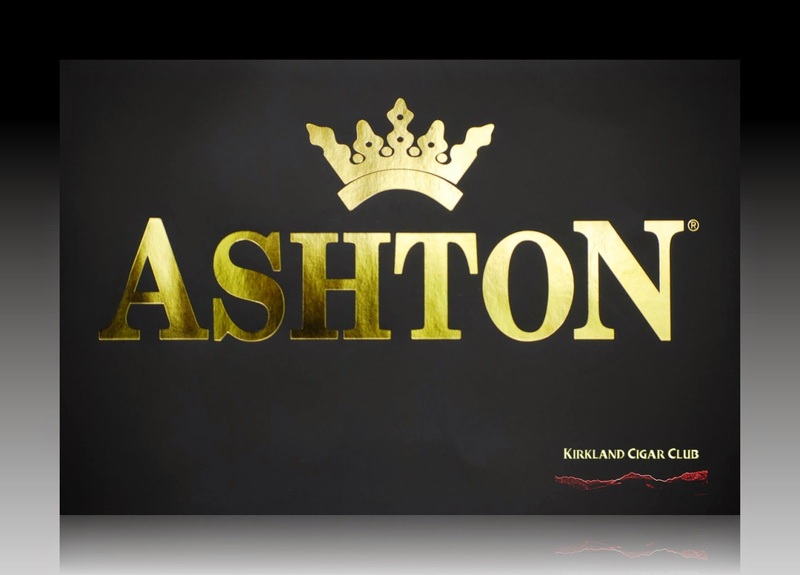 Mr. Saiid Karroum from Ashton will be here for this event to discuss all the great Ashton brands. 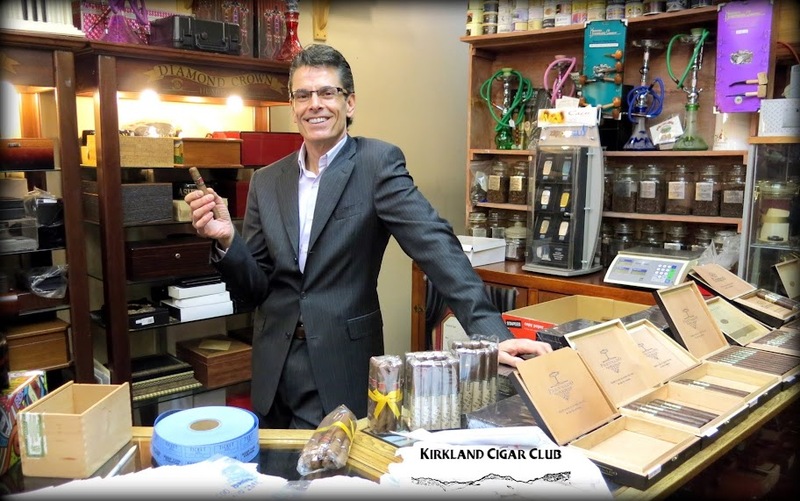 When you purchase any three of the featured cigars, Saiid will give you another one free! 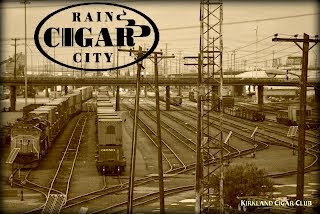 We will have our Rain City Cigar event day discounts in place on all Ashton cigars. 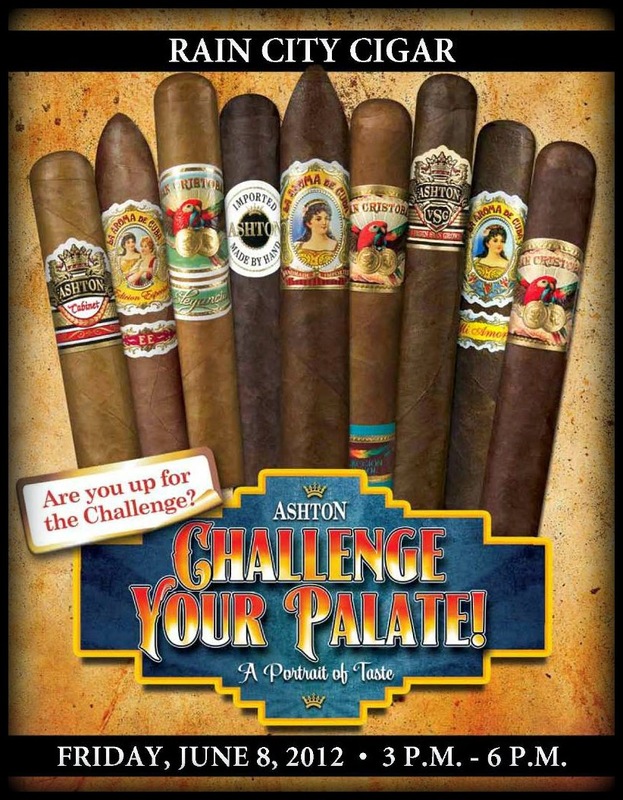 We will also have assortment packs of Ashton brands at discounted prices so you can try them all! 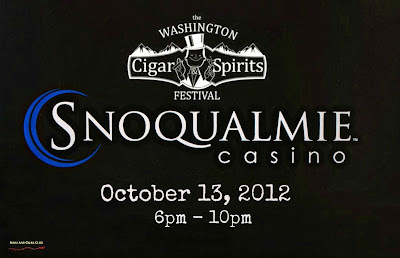 Just found out that the Washington Cigar & Spirits Festival up at the Snoqualmie Casino will be October 13, from 6pm till 10pm. 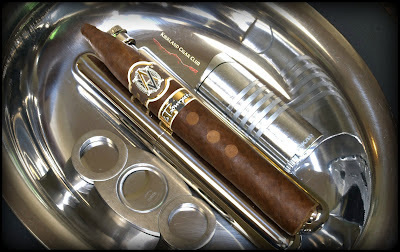 This is one of the best looking cigars that you'll ever come across. Beautiful dark rich color wrapper, eye catching label, pyramid top, and those gimmicky three little dots lined up in a row, presumably representing the valves on a trumpet. Pretty neat really, and it definitely says "buy-me" all over it! I smoked this cigar on Memorial Day, paired it with an excellent glass of single malt scotch. Burn was slightly uneven and the draw was tight, didn't deliver the big smoke that I like. Medium bodied taste with a little pepper. Personally I thought it improved greatly toward the end; smoothed out quite nice. Biggest complaint was the draw - way too much work. Oh well, doubt I'd buy one again. Another little item - I walked by the Heathman Hotel the other day and saw a sign out front saying that they're closed till August 1 due to an unforeseen catastrophe. This is a BIG hotel too! Here's the official word from their website: The Heathman Hotel has experienced a main waterline malfunction resulting in significant damage to the hotel, spa and restaurant. The entire property will be closed until August 1, allowing for repairs and renovations. And lastly, we were at the Patch on Saturday night - enjoyed a fine cigar with the gang. Few new faces: Rob, Oleg and Stan. Nice meeting you guy! Let's do it again soon, OK? Anyone notice that this was the sixth sunny weekend in a row? Is that a record for here? Join us this Wednesday, May 23rd from 6-9pm, in Lit as we feature Rocky Patel cigars and Glenfiddich Solera Reserve Scotch. 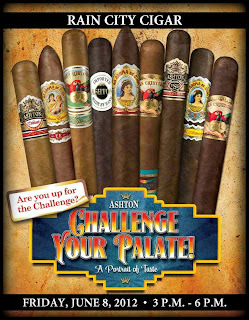 Rob Birsinger from Rocky Patel will be on hand to answer all of your questions about Rocky's great cigar lines. We've just received a new size on the popular Thunder by Nimish cigar, a 6x62 behemoth that will certainly please all of you fans of larger ring gauge cigars. Special deals include 5 free cigars and a double flame Rocky Patel lighter with all box purchases as well as the always popular Buy 3 Get 1 Free Deal. Featured brands include the Decade, Vintage, Edge and Thunder by Nimish. We'll see you there! For all of you fans of local Northwest Spirits, please check out the Bootlegger's Ball, an upcoming event hosted by the Snoqualmie Casino, the Washington State Distillers Guild and the Snoqualmie Tobacco Company & Liquor Store. The event is June 9th in the Casino Ballroom and tickets are $35. For more information visit this link. For those of you who use social media to keep informed, please check out our Facebook page as well as our Twitter feed. 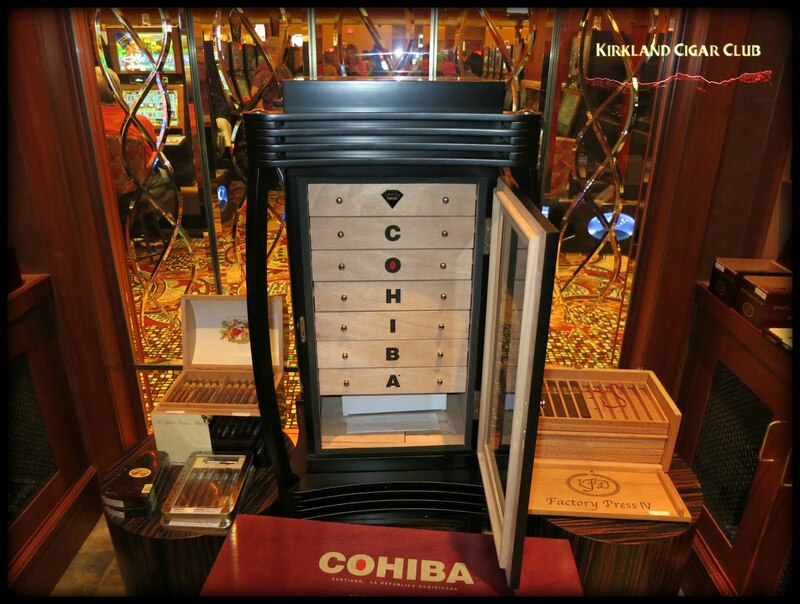 They're great ways to stay in touch with us and connect with fellow cigar smokers! Rainy Sunday afternoon. Believe it or not this has been one of the nicest months of May that I can remember, up until today of course. Anyway, I'm not sure how this cigar wound up in my humidor, possibly a friend gave it to me, who knows? I know for a fact that I didn't buy it though, just looking at the wrapper would be a good enough deterrent in my book. Firmly packed, rugged maduro wrapper, almost perfect burn, excellent draw, peppery full-bodied taste and loads of thick smoke. Heck Yes! But I doubt I'd smoke these everyday though, a touch too bold, definitely a "big-boy cigar, not for the beginner in the crowd. This is one of those cigars that will satisfy your cigar craving for a few days. No way I could smoke another cigar right after this one - I need to recover first! Troy and Nathan - great seeing you guys over the weekend! It seems summer has come upon us my friends, at least that's what I like to think. You know what this means right? It is CIGAR TIME! 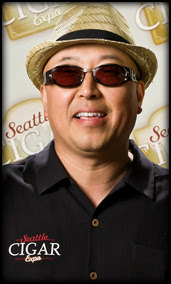 This month, we are welcoming Sam Phillips and Don Hanes from Alec Bradley Cigar Brand to Seattle and will be featuring a fantastic Sales Event on Saturday, May 19th @ 5:00pm - 9:00pm! 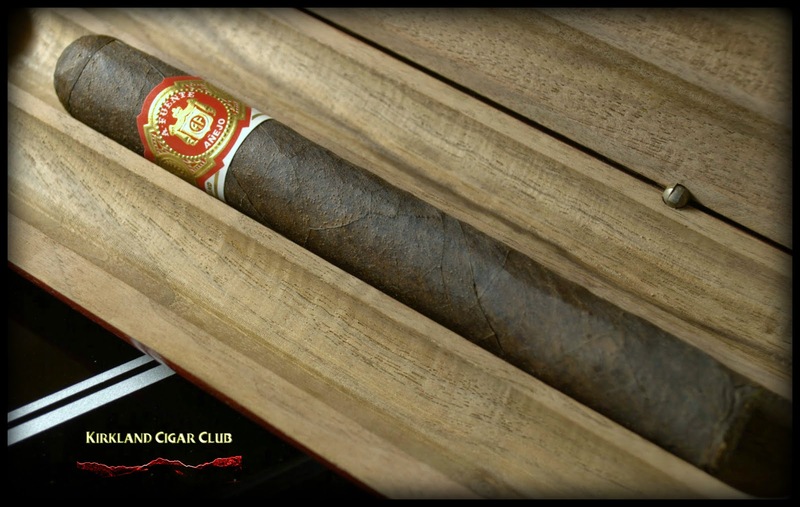 The Alec Bradley Prensado was just rated as the Best cigar of 2011 by Cigar Aficionado! 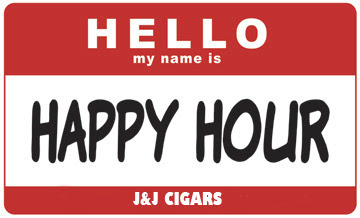 Please make time for Cigar Happy Hour each Tuesday - this month, our featured cigar is El Primer Mundo! Your first El Primer cigar each Tuesday during Happy Hour is 50% off!! Have a wonderful day and I will look forward to seeing you all soon! Come meet Sam Phillips & Don Hanes, of Alec Bradley brand of cigars on Saturday, May 19th @ 5:00pm - 9:00pm as we kick off a fantastic Sales Event featuring the Alec Bradley portfolio of cigars. The Prensado cigar has recently been named #1 Cigar Of The Year 2011 by the Cigar Aficionado. We're Raffling off great prizes! Also, adult beverages will be served! 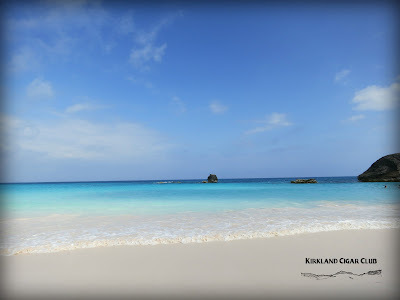 Ever been to Bermuda before? Surprisingly most people assume that it's in the Caribbean, but if you look on a map you'll see that it's way the heck to the north, way out toward the middle of the Atlantic Ocean. Anyway, this little island has been on my lovely wife's list of "places to see" for quite a while now, so since I had a little vacation time coming, now was as good a time as any to pay a visit. Super clean - Excellent transportation system - people are classy and well dressed - they drive on the wrong side - lots of quaint little English-style villages - breathtakingly beautiful beaches - and super expensive real estate. Just for the hell of it, I asked one of the three gals that was working behind the counter: "So are there any cigar bars or lounges in Hamilton, some place where I might be able to smoke a cigar?" She answered back: "No, we like to promote a healthy lifestyle - there aren't any places to smoke cigars here." It turns out that you can smoke cigarettes in most restaurant that have open air seating, but cigars and pipes are a NO-NO. You'll even see it printed on the menu: Cigarettes OK, but no pipes or cigars please! There were a few other stores that we ran across that sold (Cuban) cigars on the island, but nothing equivalent to what we have back home. I think even the worst cigar store back home is considerably better than anything that we saw on the island. I'm sure the only reason they sell cigars (Cuban) at all is to please the dumb Yanks that come off the cruise ships. Cigar friendly island? Not a chance! But I'd go back tomorrow if I could.